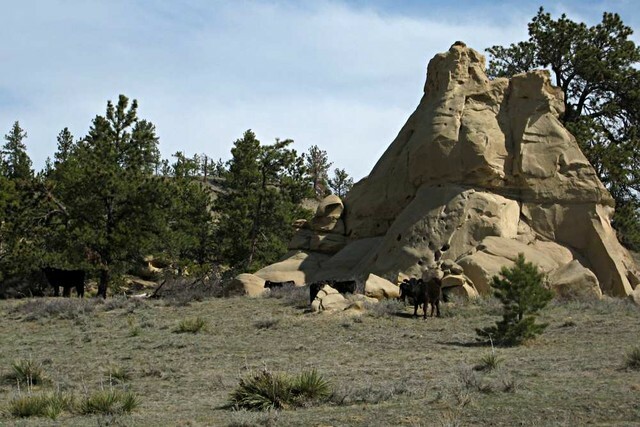 Cows and calves lolling around a rock formation after getting kicked out to the hills. They are really scattering out and looking good. I didn't have as many calves as I would have liked, the dry year last year and the late snow storm really knocked my numbers. That's the breaks, means more replacement heifers to keep this fall. Taken 4/18/2007. Was this miserable. 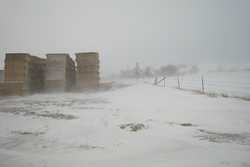 Wind blowing strong, snow falling, cold temperatures. Almost like a blizzard but not enough snow was coming down for that. This morning it has cleared off and is -20F out the wind is still blowing. The wind chills are going to be fierce out there. Taken 2/1/2007.